Part of the problem with defining is the way 'they' define us. I forced into a family situation of having to watch Children in Need on tv last night. It made me feel physically sick, the poorly, tragic but brave stereotypes like cloying thick disgusting grease that won't separate itself no-matter how much you try to wash yourself clean. Whatever happened to the campaign to shoot Pudsey Bear. A gun is not good enough. We need to go nuclear! When Shape Arts allowed non-disabled people and those who may have an impairment but who do not associate with the disability arts scene to apply for their recent [in]Visible Open show it caused much discussion in DAO's FB group. Many of the sites users were against this move, others in favour. I find myself somewhere in the middle. While I think it is sad that some disabled people do not feel they want to identify as disabled or associate with a scene made up of disabled artists, I know from my own experience that being disabled can really put a barrier up to fulfilling your career. I agree with Deborah. It's the opportunity for face to face sharing of art, ideas and experience that has underpinned the disability arts movement. I was going to respond 'yes' to animoiepete, then I saw Colin's comments, and I agree with these as well. Putting aside (to return to another day) questions around disabilty art/art by disabled people, I do think Shape has achieved something important and, as Colin says, something rather unexpected. What's missing (as in gone) is the community development aspect, creating accessible space and opportuntiies for disabled people to explore and develop a social model identity as an artist, or as a non-artist. 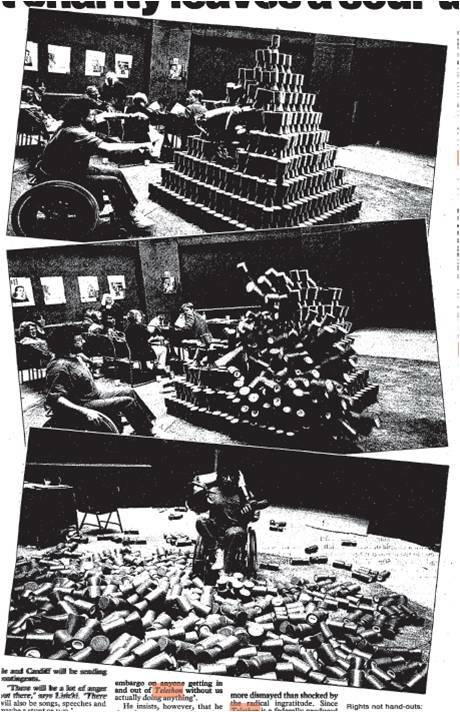 I organised a disability arts cabaret in 1996 in Berkshire, against the advice of my employers. Of all the activities I facilitated, I'd say it was the most joyful and most effective bit of awareness and consciousness raising I have achieved. The problem with the inclusive approach is that the Social Model ideals get watered down and with that our collective sense of power as disabled people to take control and to make demands. But there are pros in terms of the breadth of the discussions being had about what disability or impairment, is. [in]visible contains work about female genital mutilation. Who would have dreamt a disability arts exhibition would be showing work about those issues, a decade ago. Isn't it true of visual arts generally: that you need some of the background in order to be able to 'read' an image. A very interesting article. I often think that one of the problems of triggering an understanding of the social model visually though imagery is to do with the need to have an impaired person in the frame to activate the connotation. Otherwise the implication of the image in regard of disability is only seen by those "in the know" ie disabled people.